The addition of programs into the LMS within the last few years bridged a gap the LMS had in delivering organized learning. Prior to programs, learning teams used curricula to group courses together to assign to learners. While curricula did serve some benefits, including requirement groups and retraining options, there were still gaps in being able to deliver a syllabus-like learning experience that guided users through learning – whether it be mandatory scheduled offerings or optional reading. Furthermore, the was a lack of a cohesive “experience” with curricula in terms of being able to unify the learning content into a larger picture and bring the user on a learning journey. Programs immediately delivered on bridging these gaps. Admins could create an “agenda” of learning. They could leverage program’s use of scheduled offerings to immediately assign and enroll users into classes. They could break out the learning into sections, and could leverage learning within the system, like ILT and WBT courses, as well as outside links and text. Cover pages could be made to give learners an outline of the program and its contents, while a fresh UI broke out the learning content in easily digestible sections. Clients shifted their focus on using curricula and took to programs immediately. While curricula is still used for regulatory learning, we have seen programs took off in managing things like new hire orientation and Microsoft Office application learning. It’s ease of use for admins and positive response from learners have made it quickly become a key feature of the LMS. To set up a program, begin by logging into your admin portal. Navigate to learning>programs>add new. 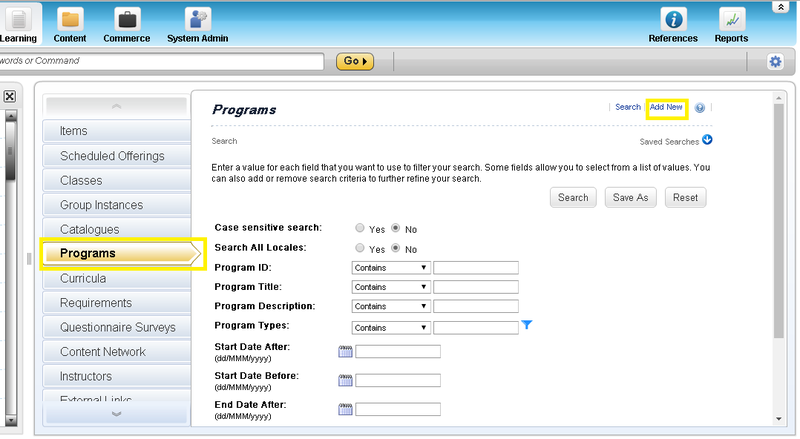 You will be prompted with a screen to add basic information on your program – similar to most other features in the LMS. Add an ID, title description, ect. The most important selection on this screen though is towards the bottom – the type, completion status, and progress restriction. The type determines time requirements and windows for learners taking the program. The scheduled type has a fixed start and end time – anyone assigned a scheduled program would start and end on the same date and time. It is important to note that if you are leveraging scheduled offerings for your program, you can only do so using a scheduled type. You would add the offering to the program and anyone assigned the program would be automatically enrolled. The other types would require you to add the ILT course and lets the learner select their own schedule offering. This is especially useful for groups that will be attending the same offerings together, such as new-hire orientation. Duration based lets learners begin the program at anytime, but are required to complete within the specified time-frame (e.g. 60 days after beginning the program). I have seen companies use this to push out required documents and reading for employees that they need completed within a certain time frame. Open-ended allows learners to complete the program at their leisure – there is no required-by date. This is great for optional learning that the learner can browse in the catalog for and take themselves, such as Microsoft Office training. The completion status is specific to the program, not the individual course. 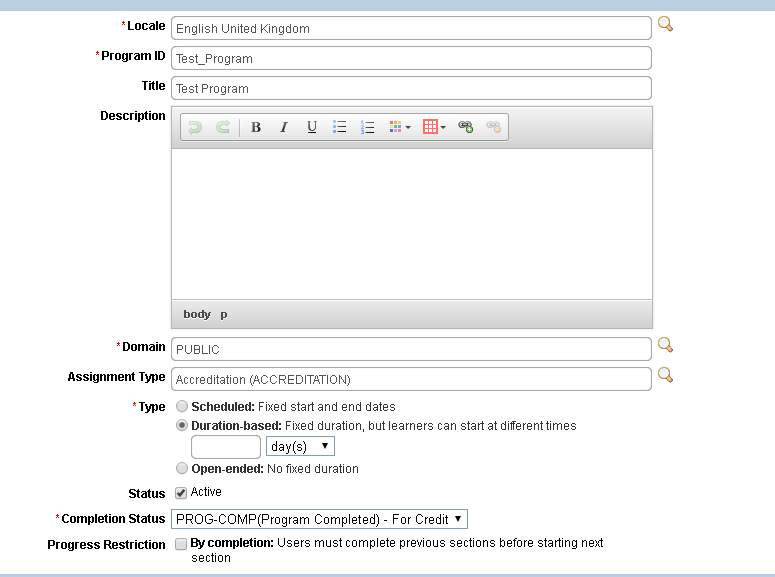 While the user will get credit for the individual courses within the program, the program completion status gives them credit for the overall program. This is very useful to see who has completed the program as a whole – for example, if someone completed the Microsoft Office program, they would get completion credit for the courses on Word, Excel, PowerPoint, ect, as well as a completion record for the Microsoft Office program. Finally, the progress restriction limits learner’s ability to begin a section of the agenda before the previously section is complete. This is great if you use one section as pre-learning, a second section as the main course group, and a final section for post-learning. This way you can make sure that your learners aren’t skipping ahead in their course work.